We are a professional company who undertake cardboard disposal in Sydney. If you are looking for cardboard removal in Sydney, then you should look no further than our professional Sydney paper and card removal services. We clear and dispose of all the cardboard we collect in a legally and in an environmentally friendly way, and so you can rest assured that when you hire us, you are hiring professionals. 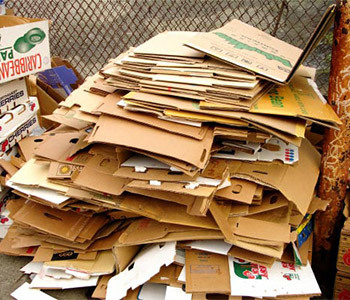 We understand how important it is to recycle cardboard, and so we are there to help you do so. You can book us to undertake cardboard disposal for you on a regular basis, which is a popular service booked by businesses, especially those who receive a lot of cardboard boxes in shipment. This takes the job off your hands, and you can get on with your main job, safe in the knowledge that the card is being collected regularly and disposed of for recycling by a professional company. We have an excellent reputation for our punctuality and our reliable cardboard disposal service, therefore we prove popular with businesses. In addition to this, many property owners in Sydney looking for cardboard disposal services in Sydney use us too. We can undertake cardboard collection in any location that suits you, be it the kerb side, a yard, or a designated building. We aim to meet the needs of the customer at all times, and ultimately make your life easier. We have all the right paper and card removal vehicles for the job, enabling us to take as much rubbish away as we can. We are highly experienced in rubbish collection, and are able to carry out all rubbish removal work effectively and efficiently. Please don’t hesitate to get in touch with us if you have any questions, we are always keen to help both existing and potential customers, and are happy to provide a free no-obligation quote. We pride ourselves in being competitively priced for Sydney rubbish removal, and are confident that we offer the best value around for our standard of professional services.